Review: Just when you thought Hong Kong cinema was dead, at best being able to dish out a few mediocre Hollywood-like blockbusters, that are insignificant and soon forgotten, too, "Two Thumbs Up" comes out of nowhere. This comedy is brimfull with innovative gimmicks, scores with an extremely densely packed screenplay which instantly wins you over for the fantastic characters and has suspense as well as laughter in store for you. Last but not least, the actors also have quite a fun ride with this movie, that much is apparent right away. Granted, there are a few flaws that can't be concealed, like the fact that some individuals get only a raw deal and therefore look rather shallow, but this actually only applies to the supporting characters. Yet, this proves that the screenplay in fact sould have been thinned out a bit. Director Lau Ho-Leung has already written the screenplays to many movies, like for example "Painted Skin" or "Triple Tap", but it is the first time for him to sit on the director's chair. And his directing actually complements his screenplay outstandingly. The energy the movie oozes out is contagious from the very first minute and the unusual camera work and different angles are integrated into the film fantastically. Apart from that, color filters are used on certain areas of the frame or the screen is seperated into several pictures like in a comic. What looks rather contrived in many other films seems quite natural, here. This may be the case because we are realizing from the very get-go that Lau brings more visual inventiveness to the screen than we are normally used to see. And with this early statement it in fact isn't a problem at all to come to terms with this. In fact, there will be viewers that won't just "come to terms" with the very strong visual style of the film, but will be outright thrilled by it. Whether it is the flashbacks or a bit of voice-over, everything in this film is a bit different than what we know of similar works. The in parts strong focus on comic aspects isn't arbitrary either, but underlines that the four robbers are "heroes", even though they may not realize this at first. Accordingly, there are constant small references to your classical superheroes. The four may have undergone a change because of the uniform they put on, but on a closer look it doesn't matter what they wear, the stuff that makes them heroes has already been part of them. An aspect that is stressed maybe even one time too often throughout the film. However, if you think that "Two Thumbs Up" is a wacky, over-the-top and gaudy comedy, think again! 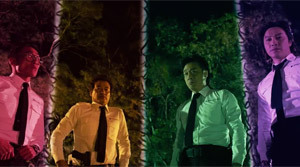 Almost the whole time the movie takes place on dark streets or within a car, which makes the atmosphere resemble that of a gritty Hong Kong thriller, too. At the same time things get quite bloody and ruthless as well, when the actual gangsters start shooting around. Thus, the high pacing doesn't just stem from the numerous gags, but also from a serious threat, even though it is hard to imagine that one of the heroes will really die in the end. The cinematic energy is the result of a brilliantly written screenplay which may be full of coincidences, but that way makes karma one of the film's protagonists as well. Moreover, this also gives you the impression of watching a stage play. Undoubtfully, "Two Thumbs Up" is also built on the chemistry between the great actors. The haircuts (!) 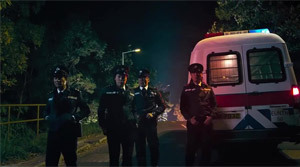 of Francis Ng ("On the Edge", "Exiled") and Simon Yam ("The Midnight After", "Nightfall") alone would justify watching this film, but next to that all four actors are also overflowing with charm that constitute the comedy's foundation. That this is actually a low-budget production never becomes apparent, apart from a few cgi scenes during the showdown, but it's easy to turn a blind eye on this considering the visual inventiveness depicted. Unfortunately, it has to be noted as well that this comedy is a bit too crowded with characters, leading to not every one of them coming into effect perfectly. Still, it is truely a big achievement what the director manages to put into his film within a time frame of merely 102 minutes. If it weren't for the at some point too obvious attempts to give the movie some sort of profound meaning as well and if there weren't countless epilogues - after the end credits have actually already started rolling over the screen - "Two Thumbs Up" in fact would deserve two thumbs up, but the way it is one will do, too (yes, this little pun has most likely been done in some way or another by other critics, too, but I couldn't help it either...).